Dornoch is 2 miles off the A9, the main trunk road to the North of Scotland. Dornoch is well sign posted and easy to find. Improvements in recent years to the road network make the journey to Dornoch an easy and pleasant one. Dornoch is around 4 hours driving time from central Scotland or Aberdeen, 1 hour from Inverness and around 2 hours from John O'Groats or the Isle of Skye. Inverness with its own Airport is 45 miles away and has a mainline rail service connecting all UK Cities. It is also the terminus for the London/Inverness sleeper service. Dornoch has a good bus service to the North and South (changing at Inverness) with a bus stop 5 minutes walk away from Dune House. 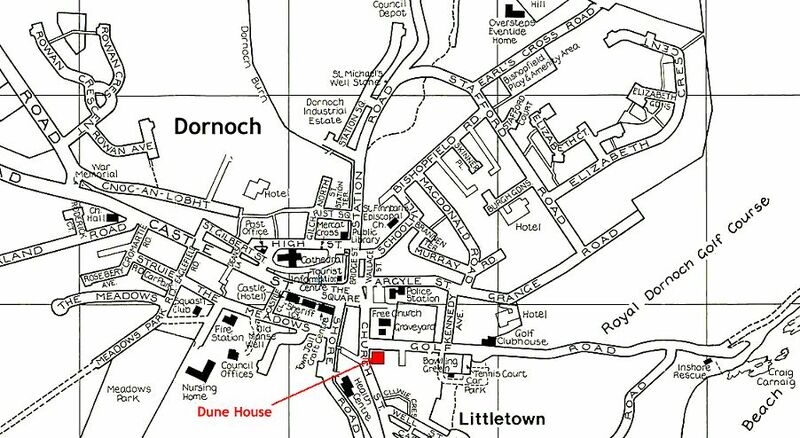 Dune House is situated within the town of Dornoch (see map below) with car parking and direct access to the garden. 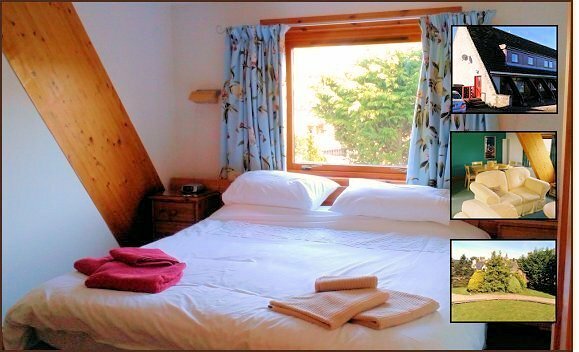 Everything in Dornoch is close at hand: for example Royal Dornoch Golf Club (2 minutes to course and Club House), Shops (5 minutes), Post Office (10 minutes), Hotels and Restaurants (5 – 10 minutes), Beach (10 minutes), Bus Stop (7 minutes), Cathedral (7 minutes), Dornoch Heritage Museum (5 minutes). Dornoch has a Championship Golf Course, an award-winning safe beach, a famous 13th Century Cathedral. Also 5 miles North of the town is the Loch Fleet Scottish Wildlife Trust Reserve. For keen golfers there are also other good and challenging courses nearby at Brora, Golspie and Tain.